Perfect Luxury Home for Groups, Ocean Views-WOW-Pool & jacuzzi, 5 mins to Beach! Luxury Villa, Breathtaking Ocean & Jungle Views, Pool, Jacuzzi, Monkeys Galore! Just a couple hours after touching down at the airport in San José, you could be floating in your own private pool at Casa Española, sipping an ice-cold glass of something alongside your favorite people. With panoramic views of the jungle, ocean and National Park, your Costa Rica adventure begins now! For a destination wedding, family reunion or other large-group getaway, Casa Española offers 11,000 square feet of affordable luxury and panoramic ocean views. At Casa Española, every suite is a master suite, with a private bath in each and ocean views from every single bedroom (yes, all of them!). No need to scramble to claim the best room, because they’re all the best room. With a total of 10 king beds (complete with hypoallergenic mattresses and pillows) plus comfortable sofabeds spread across four floors, the villa comfortably sleeps 24. And up to 30 can stay if using our additional luxury air mattresses. In other words, don't worry about last minute RSVPs from your fellow guests—we've got you covered! •	Take your pups for a walk down to the beach (Fido is welcome at Casa E!). •	A 3-5-minute walk from Manuel Antonio's restaurants, bars, shops, banks, pilates studios and other amenities. We understand it's hard to plan for large groups so we are here to help every step of the way. Ask us about our ALL INCLUSIVE packages, includes Villa, Transportation, Activities, Chef Services and Groceries! I originally came to Costa Rica on a sabbatical from a busy job in London, England. I intended to stay 3 months but after 8 years I'm still here - What happened?! Well, Costa Rica happened. With so many amazing things to do & see it really is a hard place to leave, be warned! Now I get to live in paradise, hike in the jungle, swim & surf in our beautiful warm ocean, rappel down waterfalls, raft rapids, zip-line through the jungle canopy, and so much more. Lucky me!!! With the help of great friends, I manage vacation villas & run a boutique vacation planning business, My Vacation Costa Rica. We specialize in giving our guests the personal touch & between us, we guide you through all aspects of planning your vacation & make sure you only experience the best of the best - so come us in paradise and start enjoying the pura vida life! Casa Española is a truly stunning vacation home! Located in the heart of Manuel Antonio you don't need to spend money on rental cars - everything is within 5 - 10 mins from the villa and you can even walk to some of our best restaurants and bars within 3 minutes. Located on Pacific Canyon Drive, Casa Española is neighbours with a number of other superb vacation rental homes so if your party is too large for one house - or if you'd like to spread out a little - we can connect you to other villas as discounted rates. So close to Casa Española you can wave from your balconies to each other in the mornings. With floor to ceiling glass walls throughout and all living areas and bedrooms facing the Pacific Ocean, the views are absolutely jaw-dropping from every angle. A constantly moving picture of ocean, rainforest, boats, monkeys and eagles. You really do need to see it to believe it. Set over 4 levels it offers versatile accommodation required by large groups of friends and extended family - you'll be amazed how easily you can fit everyone in, it really is enormous! Each floor is separate and fantastically unique adding different features to the house maintaining, however, always a great flow as a whole house. 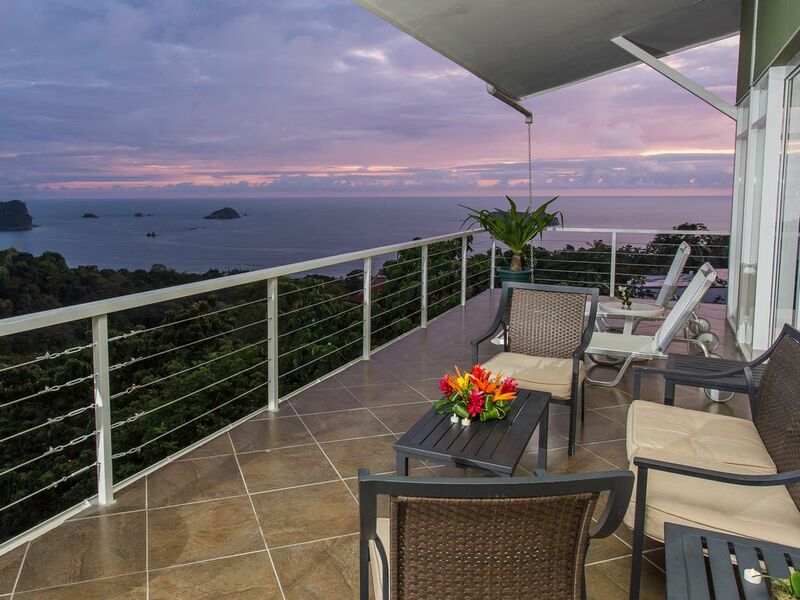 It's located right in the center of our lovely Manuel Antonio village and is within staggering distance to all of the best restaurants, bars and stores. The views from the house are amazing! You can sit on the terraces and be sheltered from rain or hot sun and feel like you're on a boat looking at the water. There are lots of trees which made it easy for the monkeys to come by for a visit most days. And gorgeous birds perch nearby. It's quiet, you can hear the ocean and howler monkeys in the distance. Karen and Marianna set up all our excursions and couldn't have been more helpful. Marianna had a wonky a/c repaired very quickly. The house was immaculately clean (housekeepers were lovely and helpful). Carlos the chef is the best! His food is amazing and he was so nice and fun to have around. My 4 year old daughter says she misses Carlos because he "makes the best food ever". During a power failure one evening he cooked a full dinner on the grill using the light from his cell phone. The location is good - walking distance to shops and there's a bus stop nearby. The road to the house is on a really steep hill which makes for a good workout after eating all the wonderful food. The only things I would note about the house: there are quite a few stairs which was a bit of a challenge for my 80 something in-laws and the layout is a little odd with access to the top level via exterior stairs or through another bedroom. It's a good set up for a big group that wants a little separation though. Also the pool was very chilly because it's sheltered from the sun (and the rain) and the jacuzzi never really warmed up. We were a group of ten, ages 4 to 85, and all had a wonderful time. Wish we could have stayed longer! My fiancée and I rented this house for our wedding. The house was just perfect for the 25 friends and family that stayed with us. We were surprised to find out that each room had its own kitchen and the room are pretty much separated from each other. We actually had privacy. The second floor can be the loudest because its the main floor with the big kitchen and pool. We all had an amazing time. The penthouses was the perfect place to have our wedding/reception. We had about 45 guess at our wedding. We had maid service everyday which was a plus. The house was always clean and it well taken care of. The location was great for us there was so many great restaurant walking distance from the house. Would definitely recommend and stay here again. Nuria, house keeping and the chef we hired for the week did an amazing job. Our party of 21 had so much space and enjoyed our stay. Great location, beautiful views, spacious and comfortable. The photos of this property don't do it justice! Our large extended family of 29 rented out all 6 rooms here and it was better than we could have hoped for! It was roomy, spacious and had beautiful views on all three main floors. We could all be together when we wanted to be but also have our own discs and privacy. Cleaning service came every day to keep the place immaculate. The concierge service was bend-over backwards accommodating and the home had everything we could have ever wanted for a weeklong stay. We would definitely come back and would recommend to all of our friends and family. What an amazing experience. The Manual Antonio area and Casa Española exceeded our expectations. All of the arrangements the staff made for us came off without a hitch. The layout of the villa and the room sizes offered plenty of space for our family of 23 to be together and at the same time, offer places for down time. The recommendations, advice, and information the staff provided about food, wine, and local things to do were invaluable. The house was well maintained and well-kept during our stay. The biggest surprise was Chef Fratini, WOW. He was more than a chef; he was a presence, the icing on the cake. We are a family that enjoys good food and eating together. Manuele provided meals that were an experience as well as being an onsite presence full of local information. I know you would get 23 positive recommendations for the villa as well as their choice of Chef services from the family. Beautiful, beautiful, beautiful. Very clean and very friendly staff. Spent a week with family and friends and would love to go back today. Five stars!!! Thanks so much for this wonderful review, Mike! :) We loved having you, your lovely family as well as your friends here with us. We hope you come back again sooner than later! Casa Espanola is nestled within tropical hillside overlooking the Pacific Ocean, the Costa Rican rainforest and Manuel Antonio National Park. It is located on the most sought after street in Manuel Antonio and is within minutes of our best restaurants and bars. You can find us approx. 200 meters down a well serviced private road in the center of Manuel Antonio. From the main Quepos - Manuel Antonio National Park road, turn right just after Cafe Agua Azul (on right) and before Byblos (on left). We are the large white villa on the left hand side. Golf: Access to the excellent golf facilities at the Marriot Los Sueños, Jacó.